The State Department said Wednesday it continues to talk to Libyan officials about next month’s visit to the New York area by Libyan leader Moammar Gadhafi. As of now, Libyan diplomats can travel wherever they wish in the United States. Under a provision of the U.S. Foreign Missions Act, however, the United States can impose restrictions on the use of diplomatic residences, such as the one in New Jersey. 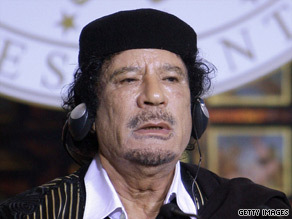 The Libyan leader often takes an ornate tent with him on international trips, using it to entertain and hold meetings.